Elizabeth Whtye Schulze wrote me to remind me of a class she will be teaching soon at Snow Farm. Please pass the word around. Class Details - Simply Coiled Baskets - Snow Farm: September 4 - 6, 2010. Using natural materials, hand dyed raffia, dried iris leaves, pine needles, and an assortment of novelty threads students will sew and coil several baskets each with a different set of materials. The simplest and most fun to make is the Handmade Rolled Basket. The class will learn to roll raffia, colored threads and other materials into a long rope that will then be used to coil a simple, colorful basket. Beads, feathers and buttons will help make this basket special. This class will be interesting and fun for all skill levels. All materials are provided by the instructor and students will be charged a fee. 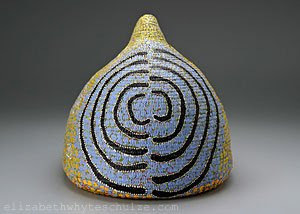 Elizabeth Whyte Schulze's stunning baskets have long been sought after by collectors. She is represented by the Katy Gingrass Gallery in Milwaukee and Ute Stebich Gallery, MA. Her work will soon be seen in the SOFA exhibit in Chicago. For more about coiled baskets and the makers who create them visit BasketMakers.com.